Insecticides have become such an important part of insect pest management that they are the first line of defence considered whenever a problem develops. As a result, producers and consumers have become quite dependent on insecticides for the production of inexpensive and esthetically pleasing foods (Chagnon and Payette 1990; Storch 1996). The availability, relatively low cost, high efficiency and ease of application of insecticides continue to ensure that they will remain the control method of choice, despite the known deleterious effects on human and environmental health. 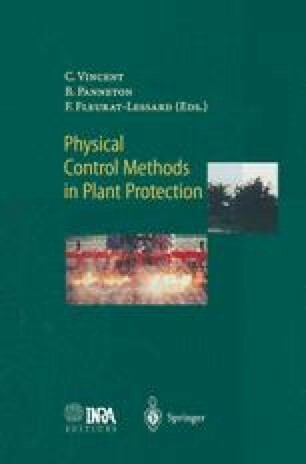 However, increasing public and media awareness of the negative side effects, erosion of the existing pesticide arsenal, and the steady development of insecticide resistance have encouraged and led to a renewal of interest in alternative control methods (e.g. Duchesne and Boiteau 1996).